Coffee and Robots | Art Good, Hitler Bad. I’ve seen this guy in the neighborhood for years. 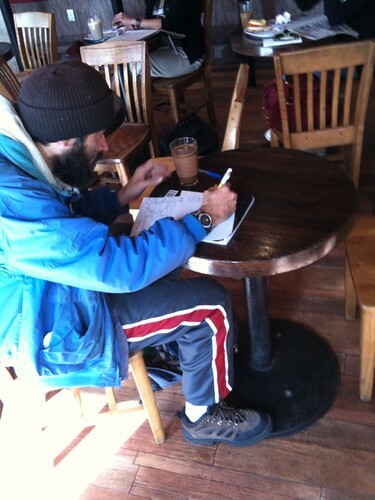 He never seems to talk to anyone, just draws at the cafe on the corner. I’ve always wondered what he works on with his multi-color retractable pen. Evidently the answer is robots. And who doesn’t love robots? Hopefully I’ll be able to sneak a better picture of his work sometime. Maybe not. Either way, it’s always a pleasure to see what the creative mind conjures up in seeming isolation.